This workshop will explore the different ways to apply wax to fabric for artists to create their own personal images. We'll cover ways to prevent the applied wax from cracking, create crack where it is desired for support the artists' design as well as supplement a design with unique wax patterning. Students will create several designs on cotton fabric with multiple dye baths so that they will fully understand the build up and overlay of patterns and design. Supply sheet will be provided upon enrollment. This class focuses on the Shibori Itajime techniques, allowing participants to create a rich interweaving of patterns using the Japanese fold and clamp. This technique is a wonderful way to get repeats of pattern without them being all exactly the identical. 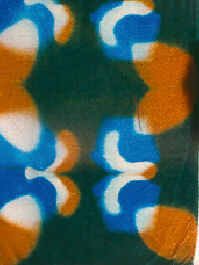 Using multiple dye baths, participants will apply different resists as well as different colors to create complex patterns. The traditional Japanese art of manipulating fabric offers a surprising array of binding methods. We'll twist and turn the fabric around a PVC pole. Using multiple PVC poles we�ll get totally different effect. 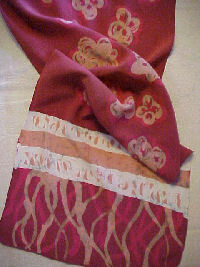 Through clamping and folding techniques, a rich layer of overlapping patterns will develop. With a variety of stitched resists, patterns like willow leaves, spider webs or even wood grain motifs will evolve! This class will help to extend your art whether you are making quilts or wearable clothes. We will use a variety of techniques to manipulate the fabric and use an Indigo Dye Pot to color the fabrics. We will use the less toxic form of Indigo so that students can go home and create their own Indigo Dye pot. 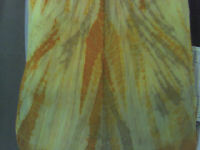 It's a great way to dye fabric (your art) whether you are making quilts or clothes.